Joseph Bellows Gallery is pleased to present an exhibition of photographs by J. John Priola. The gallery will feature selections from Priola's series Paradise, Saved, Residual, and Windows. In the series Paradise, common objects such a wishbone, a feather, a wooden box, an apple, and a pair of dice are photographed against a deep, black background and printed in perfectly round circles. Ordinary objects, now spotlighted, suddenly become extraordinary. Priola's minimal and formal treatment of these familiar objects allows the viewer to closely examine their formal qualities. Taken out of the context of everyday life and devoid of human presence, the objects are left to the viewer to be imbued with meaning. In doing so, we become aware of the power simple objects have to evoke complex emotions and memories. The series Saved also features solitary objects photographed against a stark black background. These objects seem to have been rescued from old attics and thrifts stores. Broken figurines, torn photographs, a cracked china plate, and an old lace handkerchief become relics of the past and traces of past lives; both the lives of the objects themselves and the lives of those who once owned them. There is a sadness and a melancholy inherent in these photographs as they are a reminder of mortality, of loss, and of the passing of time. The Residual series even more profoundly implies passing time and even death. Priola photographs a puff of smoke, a single bubble, and a spider web; objects whose life must have ended shortly after the photograph was taken. In his series Windows, Priola photographed San Francisco windows seen from the outside at night. 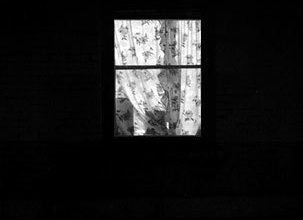 Although the windows reveal nothing reveal nothing of the homes' interiors or their residents, the photographs posses an eerie and voyeuristic quality. Surrounded by vast black backgrounds, the lighted windows are beautiful studies of light and shadows, and like Priola's other work, are also studies of objects. J. John Priola was born in Denver, Colorado. He received his B.A. from Metropolitan State College in Denver in 1984 and his M.F.A. from the San Francisco Art Institute in 1987. His work has been shown in major exhibitions including, "In A Different Light," at the University Art Museum, Berkeley, "Prospect '96", at the Schirn Kunsthalle, Frankfurt, Germany, and most recently, "Picturing Eden," at the George Eastman House in New York. Priola's work is represented in the collections of the Metropolitan Museum of Art, the Art Institute of Chicago, the Philadelphia Museum of Art, the Museum of Fine Arts Houston, the Los Angeles County Museum, and the Museum of Modern Art, San Francisco, among others. He currently lives and works in the San Francisco Bay Area.